On any transaction screen – as showed in the first image of this post – any registered user, who was involved in the transaction, can tag themselves as having participated in one (or more) roles: Owner’s Broker, Buyer’s Broker, Owner, Buyer, Owner’s Counsel, Buyer’s Counsel, Mortgage Broker, Lender, Owner’s Property Manager or Buyer’s Property Manager. If you have suggestions for other roles, please let us know. 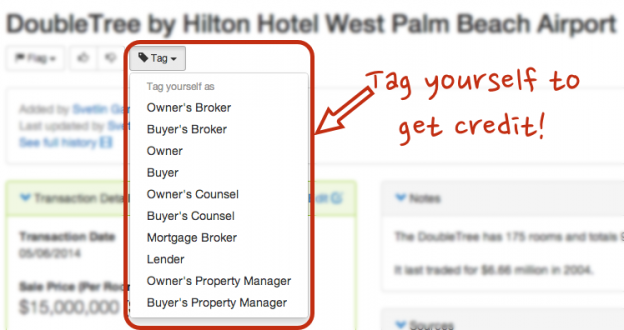 Once you tag yourself in a transaction, your tag will show up at the very top info box. If you don’t want to be tagged in a particular role – or made a mistake – you can click the “Remove” link after your name and the tag will be removed. Your collection of tags will be aggregated and highlighted in your profile with a detailed transaction list available to all registered users. Let us know what you think. Happy tagging!